We provide dedicated ground source heat pump drilling services for all aspects of Ground Source Heat projects from the installation of the geothermal borehole with our specialised equipment to the installation of the connection pipe work and manifolds along with more specialised thermal response tests for design of the borehole array installation. Projects are undertaken nationally for single a single or multi borehole installations working with both private domestic clients or multinational companies. We work alongside accredited MCS GSHP partners offering full turnkey ground source heat pump drilling and installation service packages utilising the best choice of system to suit the project using Dimplex, Vaillant, Worcester Bosch, Steibel Eltron, Kensa or NIBE heat pumps throughout the UK. On completion all boreholes are pressure tested before grouting as well as on completion to ensure the integrity of the ground source loop, this is then documented and as part of our ground source heat pump drilling services and the Client issued with certification of the pressure test. Should we install the connection pipe work this will also be pressure tested and certified, pipe work if required can then be sanitized and flushed before the final addition of the heat transfer fluid ready for connection to the ground source heat pump. All ground source heat pump loops and connecting pipework are installed with electro-fused couplers and electronically quality assured with our electro-fusion equipment with borehole loops, pipe work and fittings made from PE100+ polymer to ensure the highest quality of installation and compliance with the Vertical Borehole Standards issued by the Ground Source Heat Pump Association in September 2011. Teckna Group working with our geothermal and water hydrologist can also offer geological surveys for basic geological and heat assessments through to more complex ground modelling and borehole field design with thermal response testing if required to complement our other geothermal services. At Teckna Group, we provide geothermal borehole drilling for a wide range of ground source heat projects. Our complete service begins with the installation of the geothermal borehole, followed by the installation of pipe work and manifolds. Teckna Group undertakes projects of all sizes, from single residential geothermal borehole drilling to borehole drilling for multinational companies. We work alongside accredited MCS GSHP partners offering full turnkey ground source heat pump drilling and installation service packages. The range of systems available to us allows us to select the most appropriate for each geothermal drilling project with GSHP installers utilising Lämpöässä, Dimplex, Valliant, Worcester Bosch, Steibel Eltron, Kensa or NIBE heat pumps throughout the United Kingdom. 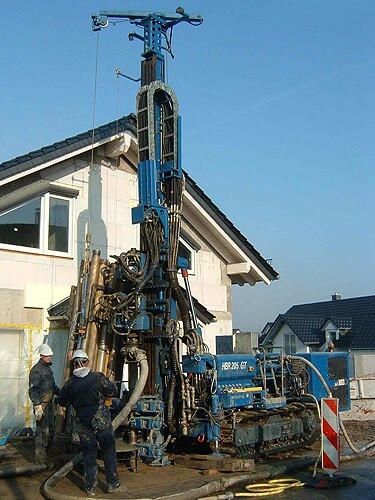 All our geothermal boreholes are pressure tested before grouting and upon completion. This ensures the integrity of the ground source loop. The pressure testing is then documented, and as part of our geothermal drilling service, the client is issued with certification of the pressure test results. If you decide that Teckna Group are the experienced team of borehole contractors to install the connection pipe work, this will also be pressure tested and certified. If required, the pipework can then be sanitised and flushed prior to its connection to the ground source heat pump. All the ground source heat pump loops and connecting pipe work, that is supplied by Teckna Group, is installed with electro-fused couplers. It is also quality assured with out electro-fusion equipment to ensure the highest quality of borehole installation. All projects are completed in compliance with the Vertical Borehole Standard issued by the Ground Source Heat Pump Association in September 2011. Teckna Group also has the ability to offer geological surveys to our customers. Alongside our geothermal and water hydrologist, we deal with basic geological and heat assessment right through to complex ground modelling and borehole field design. We also offer thermal response testing to compliment our other geothermal borehole drilling services.